You don't find many nice, original Escalade models anymore, but here's one. We've listed some good deals on certified pre-owned vehicles that will help you a used car with a warranty, while staying on budget. The Cadillac Escalade has long been known for its bold, expressive styling, its large size, its luxurious interior and its brawny V8 engine. Last year, the Escalade was completely redesigned, and the all-new model still manages to include each of those important traits. In terms of styling, the 2016 Cadillac Escalade looks like its predecessors, but closer inspection reveals last year's redesign brought many important changes. Every panel is new, and there are many new touches, such as revised headlights and taillights and an updated profile, giving the Escalade a modern look. Like previous models, the latest Escalade is based on the latest Chevrolet Tahoe and GMC Yukon. 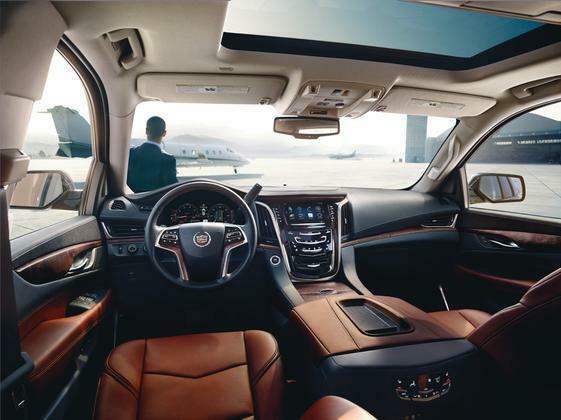 Inside, the Escalade was also significantly updated last year. Not only is the interior revised with a new look, but it also features a long list of new equipment, both standard and optional. As for the V8, it's still there, and last year's 6.2-liter powerplant now puts out 420 horsepower and 460 lb-ft of torque. 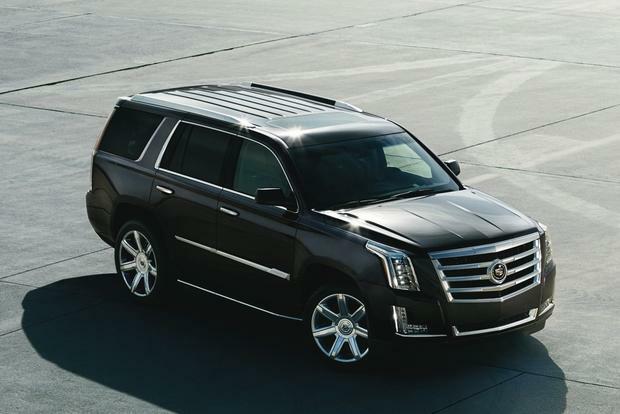 After major changes last year, the Escalade is largely unchanged for 2016. Updates include a slightly revised CUE infotainment system and two new options: lane-keep assist and a front-view camera. 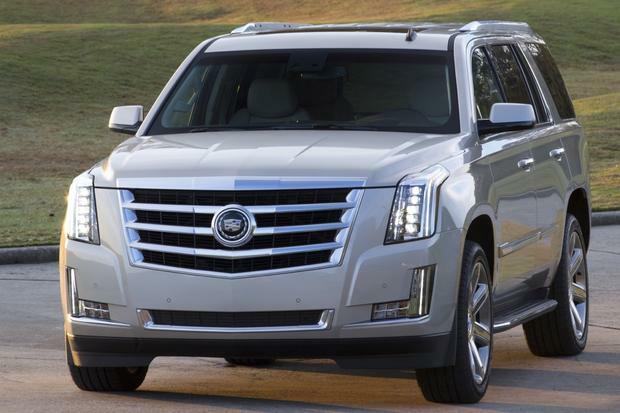 The 2016 Escalade is offered with only one engine, a 6.2-liter V8 making 420 hp. It's mated to a standard 6-speed automatic, and it returns 15 miles per gallon in the city and 21 mpg on the highway in 2-wheel-drive guise or 14 mpg city/21 mpg hwy if you opt for 4-wheel drive. 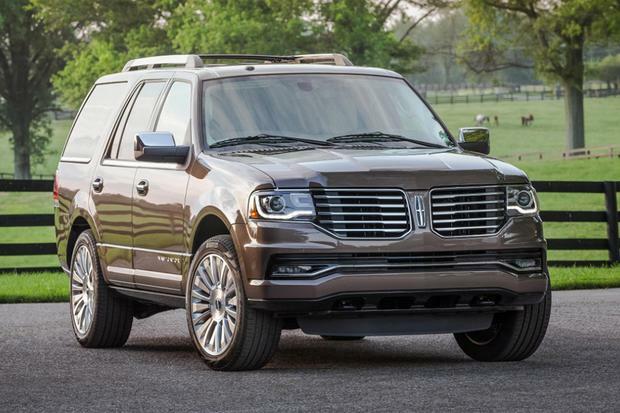 Four-wheel-drive versions of the long-wheelbase Escalade ESV carry around enough extra weight to earn a slightly worse Environmental Protection Agency rating of 14 mpg city/20 mpg hwy. The Escalade comes in two body styles, a regular-length model simply called the Escalade and a long-wheelbase version dubbed the Escalade ESV. Both are available in four trim levels: base-level Standard, midlevel Luxury, upscale Premium and range-topping Platinum. Shoppers who choose the Escalade Standard ($74,000 for the Escalade; $77,000 for the ESV) receive a long list of standard equipment, including a navigation system, Cadillac's CUE infotainment system with an 8-inch touchscreen, Bluetooth, satellite radio, HD Radio, heated and cooled front seats, heated rear seats, a heated steering wheel, power adjustable pedals, remote starting, tri-zone automatic climate control, 20-in alloy wheels, LED headlights, front and rear park assist and a backup camera (with a new-for-2016 front-view mode). Step up to the Escalade Luxury ($78,000 for the Escalade; $81,000 for the ESV), and you'll add 22-in alloy wheels, a power sunroof, a full-color head-up display and a long list of safety technology, including rear cross-traffic alert, a blind spot monitoring system, forward-collision warning, lane-departure warning, new-for-2016 lane-keep assist and Cadillac's Safety Alert Seat, which vibrates to let you know if you're drifting out of your lane. Next up is the Escalade Premium ($82,500 for the Escalade; $85,500 for the ESV). It includes front and rear automatic braking in the event of a collision, a rear-seat entertainment system, adaptive cruise control and a collision-preparation system. At the top of the range is the pricy Escalade Platinum ($90,000 for the Escalade; $93,300 for the ESV). It adds heated and ventilated 14-way power front seats with massaging capabilities, a cooled center console, two headrest-mounted rear entertainment screens and upgraded materials, including specialized doorsills, a suede headliner and higher-quality leather upholstery. As for options, the Escalade's list of available extras is primarily limited to features included on upper-level models. Drivers who choose a base-level Escalade, for instance, can add several of the Luxury trim's features. Other options include additional chrome exterior trim and available power retractable running boards. The 2016 Cadillac Escalade comes with a long list of standard safety features, including dual front airbags, front side airbags, side-curtain airbags, traction control, stability control, front and rear park assist and a backup camera. Available safety features include rear cross-traffic alert, a blind spot monitoring system, automatic braking, forward-collision warning, lane-departure warning, lane-keep assist, a collision-preparation system and a Safety Alert Seat, which vibrates if a driver strays from their lane. Although the Escalade has not yet been submitted to the National Highway Traffic Safety Administration's full battery of tests, it has received a 5-star side-impact rating and a 3-star rollover score. A frontal crash rating will determine its overall score. 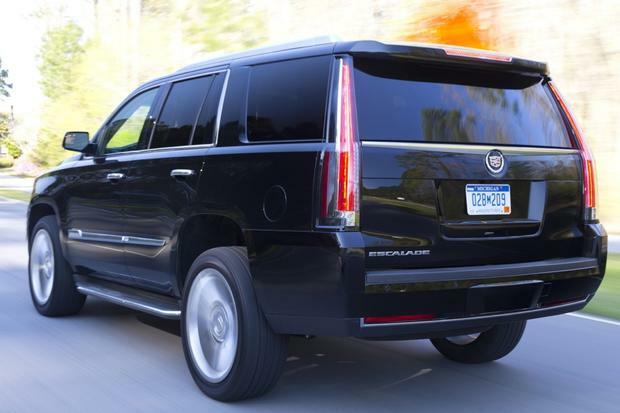 The Escalade has not yet been tested by the nonprofit Insurance Institute for Highway Safety. The Escalade may be all-new inside and out, but the SUV's basic idea is largely the same. This means big power, a muscular sound and a driving position that looks down on virtually every other vehicle on the road. If that's what you're looking for, the Escalade is an excellent SUV for the job -- only now you look down from a slightly nicer perch. The interior is a vast improvement over the old model, which was a vast improvement over its predecessor. 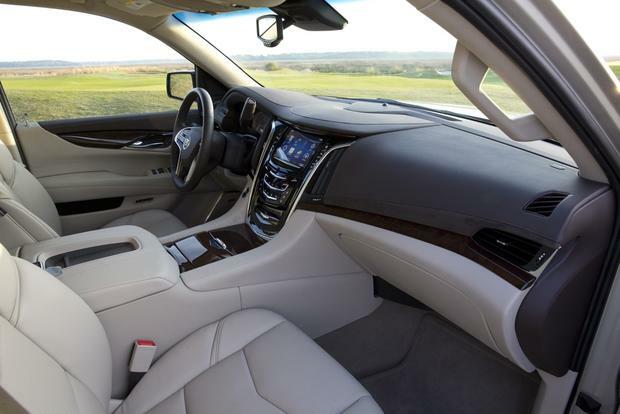 We're impressed with how well Cadillac has managed to keep up with the latest in interior design, though the Escalade still can't touch rivals, such as the Range Rover, for overall quality. Then again, it isn't as expensive as those rivals, either. On the road, the Escalade drives much as you'd expect: like a big, bulky truck. 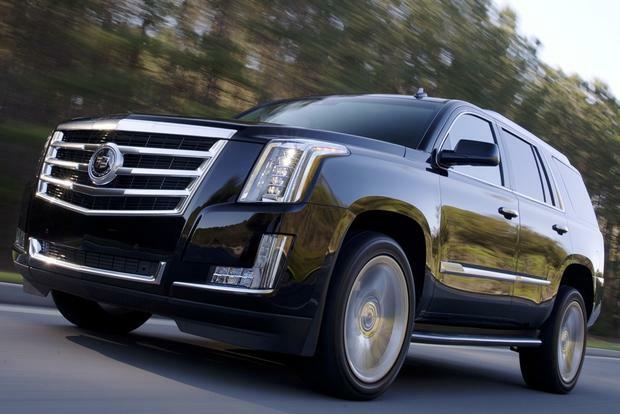 Now, in its fourth generation, the Escalade doesn't come with any big surprises, even with Cadillac's impressive Magnetic Ride Control suspension system. The Escalade may be quick thanks to its 420-hp V8, but it's no sports car, a fact especially obvious when you go around corners. Still, the SUV is nicely composed for a luxury vehicle, even if there's more body roll than we'd want. As for comfort, that's where the Escalade shines. 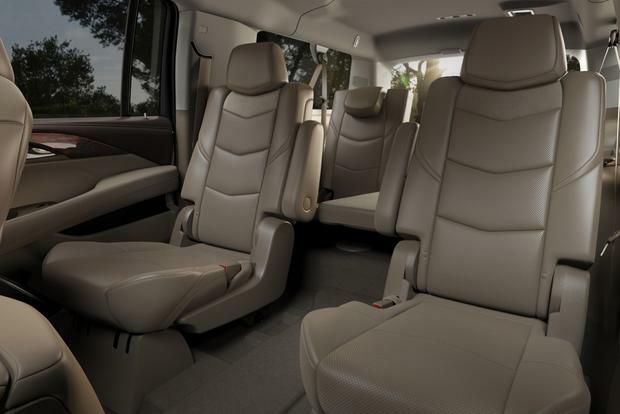 While the SUV's ride is bumpier than we'd expect, largely owing to 22-in wheels in most trims, the Escalade offers plush seats and a floaty feel soaking up most bumps, a quality most luxury-SUV shoppers will truly appreciate. 2016 GMC Yukon Denali -- GMC's own Yukon Denali is mechanically identical to the Escalade. It also uses many of the same chrome accents and bold styling cues. If you can't find an Escalade at the price you want, consider visiting the local GMC dealer to find out if they'll give you a good deal on a Yukon Denali. 2015 Infiniti QX80 -- The V8-powered Infiniti QX80 shares the Escalade's formula of offering brawny styling and a long list of opulent features. The QX80 is also less expensive than the Escalade, with a base price of around $64,300 with shipping. 2016 Lexus LX 570 -- Lexus' full-size luxury SUV isn't as well-known as the Escalade, but it offers similar equipment, similar sizing, a brawny V8 and Lexus' famous durability. Used Land Rover Range Rover -- Although a new Range Rover's starting price of around $86,000 makes it too pricy to directly compete with the Escalade, used models are worth a look if you're interested in another luxury SUV that offers a king-of-the-road driving experience. 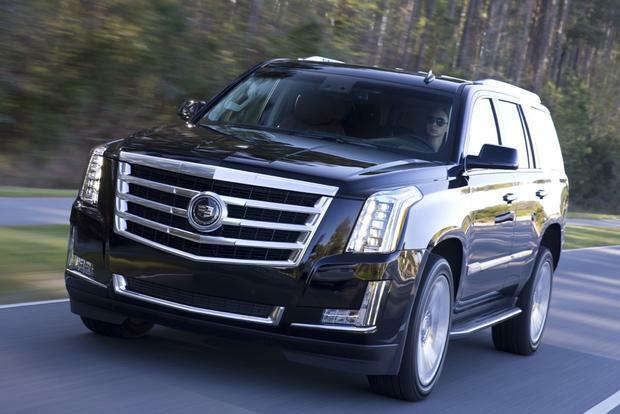 If you're a fan of the full-size luxury-SUV segment, you've probably already formed a love-it-or-hate-it opinion of the Cadillac Escalade. With brawny styling, a huge, thirsty V8 and an enormous footprint, the Escalade takes a certain type of buyer to appreciate it. Our personal favorite model is the base-level Escalade Standard, which we feel offers everything you could need from a luxury SUV, along with many high-end extras.